Champions, but only just, as a skilful fast paced NUI Galway side were made work for the title against a DCU Dochas Eireann in the All Ireland Fresher football final in a well-appointed Tubberclair on Thursday 14 March. DCU arrived at the Westmeath venue chasing their fourth straight title at this level, but the Galway side just about deserved to win this game, with a brace of well taken goals from Ballinrobe native and Mayo starlet Tommy Conroy crucial in deciding the outcome. Indeed, DCU accounted for NUI Galway in the 2017 decider played in Abbottstown. The pressure was great on the eventual champions in the dying minutes, culminating with the referee showing two black cards to the Finian Hanley managed side in the closing stages. The strong wind at Tubberclair favoured the Capital side in the opening half, but did little to enhance their scoring threat as they kicked as much wide as they scored. The Evan O’Brien managed side had a dream start, as Conroy found the net after less than half a minute with a powerful run down the heart of the DCU defence, before shooting past David O Hanlon in the DCU goal. DCU attacked with success, culminating with a free from Laois stat Mark Barry before Roscommon corner forward Cathal Heneghan pointed for NUI Galway. Indeed, the Rossie Under-20 star with strong Clare hurling connections was indeed the star of the forward ranks all season for the champions. Three successive DCU scores led by Donegal senior panellist Shane Gallen levelled procedures before Heneghan restored NUI Galway’s advantage with a sweet side step and strike. As the game entered the final five minutes of the opening half, little divided the two fast moving sides. NUI Galway needed to strike big and it was left to Tommy Conroy who added his second goal to give NUI Galway a three-point lead. The Neale player found himself the receipt of a stunning Crossfield pass from Heneghan and made no mistake with the finish. From the following kickout, this was followed up by another Heneghan effort to leave the Connacht college four clear, and looking likely to hold a half time advantage. The first real doubt on the credentials came at this period of the final, as James Doran who was busy in the opening half responded for DCU before Mark Barry found the net on the stroke of half time, to ensure parity on a score-line of 2-5 to 1-8. Now, NUI Galway aided by the second half wind that decreased markedly in the final 20 minutes had to start the second half all square, which was probably unfair to their first half charge. Without question this was one of the better fresher football finals in recent years as both sides went for the win without over use of any defensive system, and this fact was pleasing on the eye of those present in Tubberclair. James Doran, of whom football supporters will hear more of, kicked the first score of the new half for DCU to give them a short-lived lead. Gavin Durcan and Robert Walzer hit back for NUI Galway whose frees from long range were a highlight of the second half. After 40 minutes, DCU were in arrears by a brace of scores, but still very much in the hunt for the Dave Billings cup. Roscommon native Peter Gilloly halved the NUI Galway lead in the 42nd minute before Walzer once more from a distance, and the impressive Mark Barry, swopped scores as the game entered the final quarter. Cathal Heneghan, Mark Barry, Heneghan and Walzer once more brought the game to a crescendo with stunning scores as NUI Galway led 2–12 to 1–12 with five minutes left on the clock. A massive score that proved the match winner in the final analysis came from the boot of Bearna’s Sean McUidin to sneak the western college four clear with less than four minutes of normal time on the clock. DCU’s Darragh Kirwan registered a much-needed score to reduce the deficit to three and twice DCU players were fouled in scoreable positions, with the referee left with little choice but to show two black cards twice. DCU were attacking and with the North Dublin side two points down, a real scoring opportunity presented itself and James Doran was taken to the ground by Dylan Buckley, who was shown a black card. Mark Barry was accurate as ever pointing the resulting free. Once more from the NUI Galway kickout the ball fell to DCU, but they could not score or create a free taking opportunity, and when three minutes of injury time was played, Brian O Leary effected the long whistle. The champions were served well by Cian Lankford, Mark Barrett, Conor Campbell, Gavin Burke, Evan O Brien, Gavin Durkan, Robert Walzer, goal hero Tommy Conroy, my man of the hour Cathal Heneghan and Sean McUidin. One must acknowledge the efforts of DCU, who whilst perhaps not as impressive as NUI Galway, over the hour had their moments and will regret nine first half wides. Their best included Oisin Gallen who did not repeat his first heroics, Mark Barry, Darragh Kirwan, Neil Matthews, James Doran, Matt Moran, PJ Masterson and Peter Gilloly. 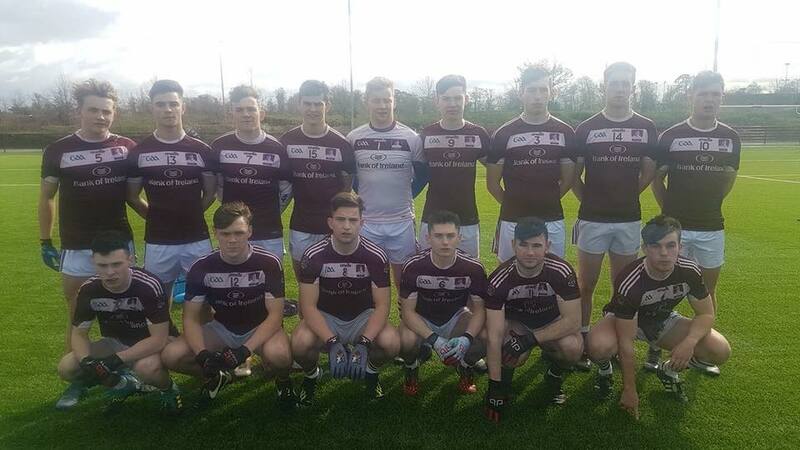 NUI Galway: Cian Lankford (Kilavullen, Cork), Dylan Buckley (Claregalway, Galway), Mark Barrett (Ballymore Eustace, Kildare), John Cooke (Crosserlough, Cavan), Gavin Burke (Corofin, Galway), Conor Campbell (Claregalway, Galway), Jack McSharry (Na Cealla Beaga, Donegal), Evan O’Brien (Ballinrobe, Mayo)(0–1), Gavin Durkan (Castlebar Mitchels, Mayo) (0–1), Dean Brophy (St. Joseph’s, Laois), Robert Walzer (Salthill/Knocknacarra, Galway)(0–3), Liam Burke (Ballinrobe, Mayo), Cathal Heneghan (Michael Glaveys, Roscommon)(0–6), David Kelly (Carbury, Kildare), Tommy Conroy (The Neale, Mayo) (2–1). SUBS: Lorcan Molloy (Menlough, Galway) for L Burke, Sean McUidlin (Bearna, Galway) (0–1) for O’Brien, Ryan Cunningham (Na Cealla Beaga, Donegal) for Kelly (50), Evan O’Brien (Ballinrobe, Mayo) for Durkan, James Sugrue (Renard, Kerry) for Walzer (59), Mattias Barrett (Naomh Anna Litir Mor, Galway for Buckley. DCU Dochás Eireann: David O’Hanlon (Na Fianna, Dublin), Daniel Corcoran (Geraldine’s, Louth), Matt Moran (Whitehall Colmcilles, Dublin), Conor Doyle (Clontibret, Monaghan), Oran Doogan (Kildare, Donegal), Neil Matthews (Erin’s Isle, Dublin), PJ Masterson (Abbeylara, Longford), Seamus Lacey (Ballylinan, Laois), Darragh Kirwan (Naas, Kildare) (0–2), Joe Hagan (Dromard, Longford) (0–1), James Doran (Na Fianna, Dublin) (0–2), Lanty Molloy (Naomh Columba, Donegal), Oisin Gallen (Sean Mac Cumhaill, Donegal)(0–3), David Lacey (Na Fianna, Dublin), Mark Barry (O’Dempseys, Laois) (1–6). Subs: Harry Ladd (Lucan Sarsfields, Dublin) for Molloy, Fiachra Potts (Na Fianna, Dublin) for Moran, Peter Gillooly (Roscommon Gaels, Roscommon)(0-1) for Lacey, Brian Diver (Letterkenny Gaels) for Hagan, Mikey Culhane (Salthill/Knocknacarra, Galway) for Gallen, Alan Mulvany (Senchalstown, Meath) for Doyle.